Rooting around in my wargames storage cabinets (good old IKEA) I found some photos of old games going back nearly 25 years. 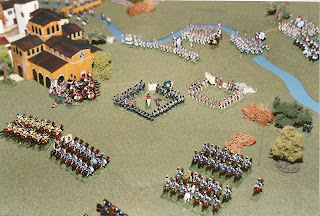 Knowing that many present day wargamers are of my vintage, I thought it might be fun to share a selection with readers of this blog. Ah, nostalgia! All the photos have been scanned in so a little quality has been lost. This one is marked 1987. 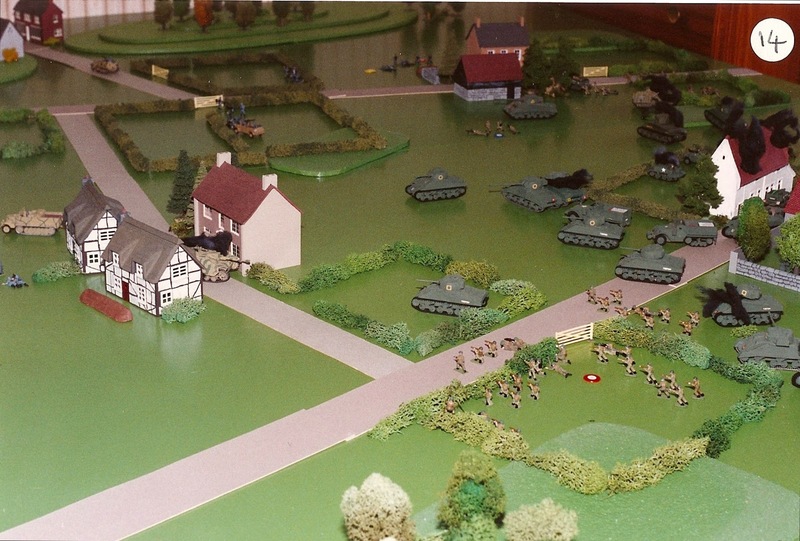 Back in those days I was wargaming late WW2 and occasionally ACW, both with Airfix plastics. Sadly, no photos of my ACW games ever got taken but this shows what my WW2 games looked like. 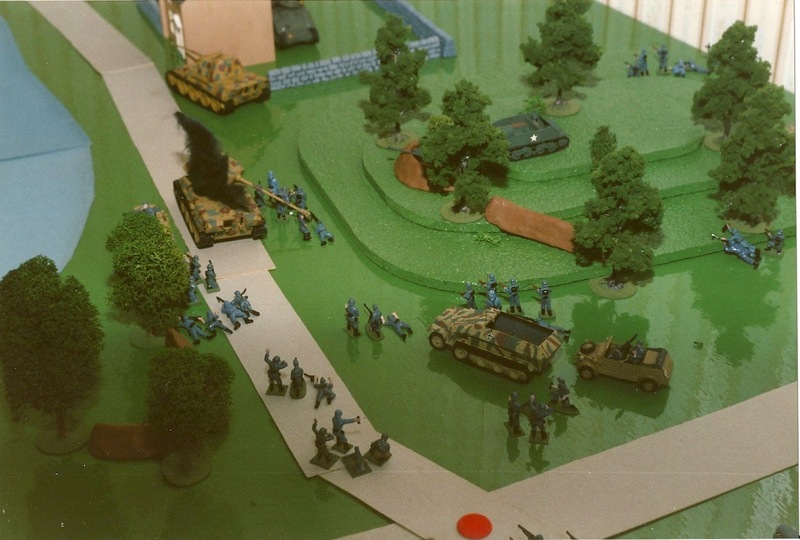 Airfix figures on individual bases, with the odd Matchbox figure added. Note the US Marine bottom left, painted to represent a German radio operator, with plasticine blob radio just as Mr Featherstone's books had recommended. 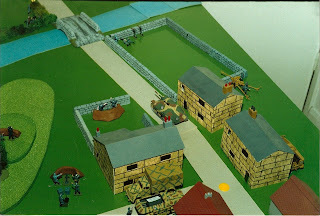 Home made buildings and plasticine trenches. 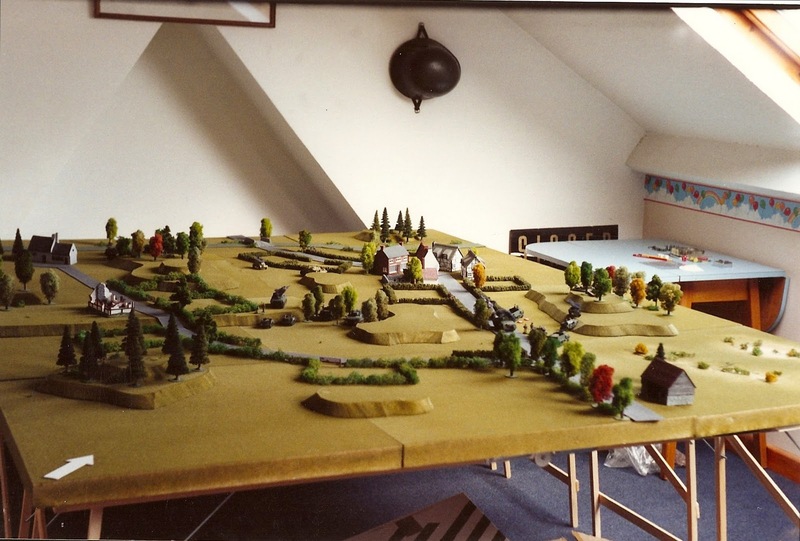 Of course, any gentleman wargamer will recognise the Bellona walls and bridge. The bridge at least is still with me. 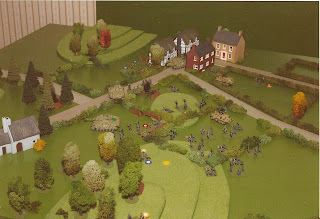 At this time I was using Charles Grants rules from his Battle - Practical Wargaming book. The two pictures below date from a couple of years later. 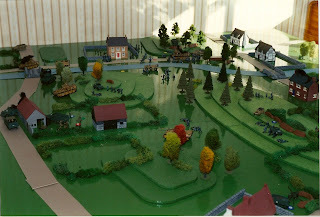 I've still got essentially the same figures but new buildings and trees. Dig that gloss painted board! I had begun to branch out into some new resin vehicles, like the Loyd Carrier in the lower picture. The Charles Grant rules got modified and modified again until almost unrecognisable. I only played commercial sets when playing away with other gamers. Eventually I ended up with what were really my own WW2 rules which (I eventually realised) became far too complex. In a while the board got a couple of coats of matt varnish. 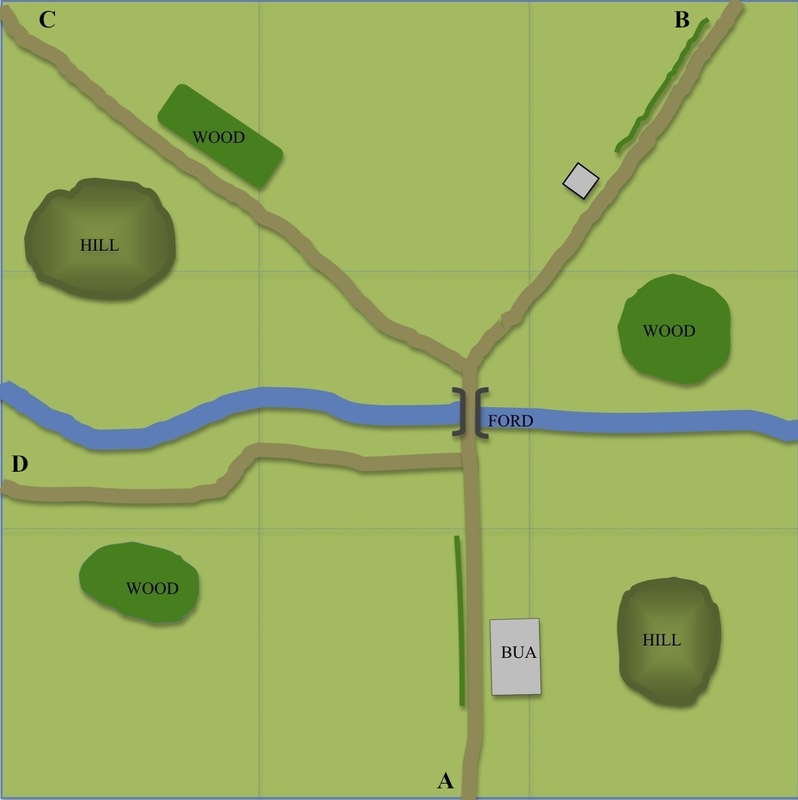 The 3 photos below are from a game based on Operation Goodwood. 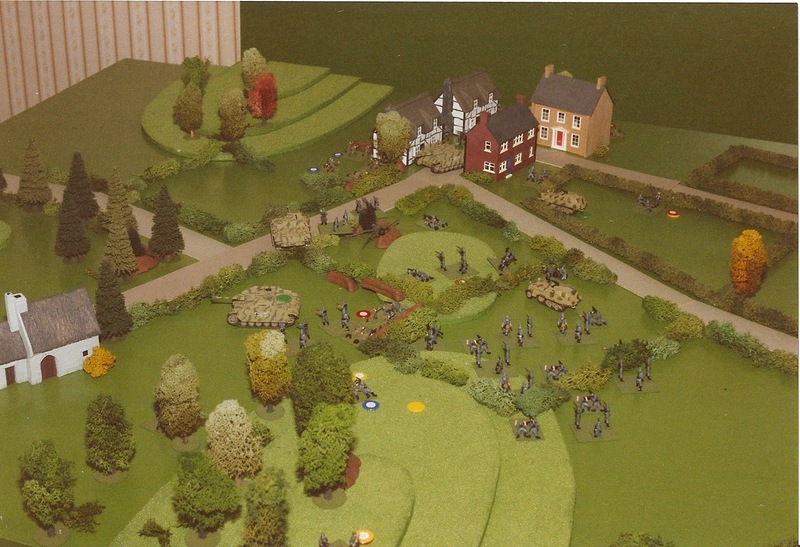 Those Infantry Combat Group figures are still going. 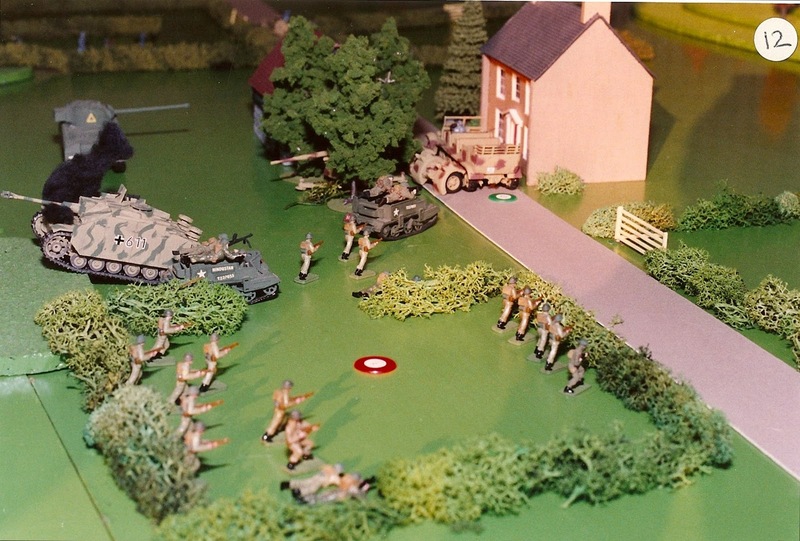 Note that I couldn't be bothered to paint them properly - just the detail was painted in (packs, boots, rifles etc). 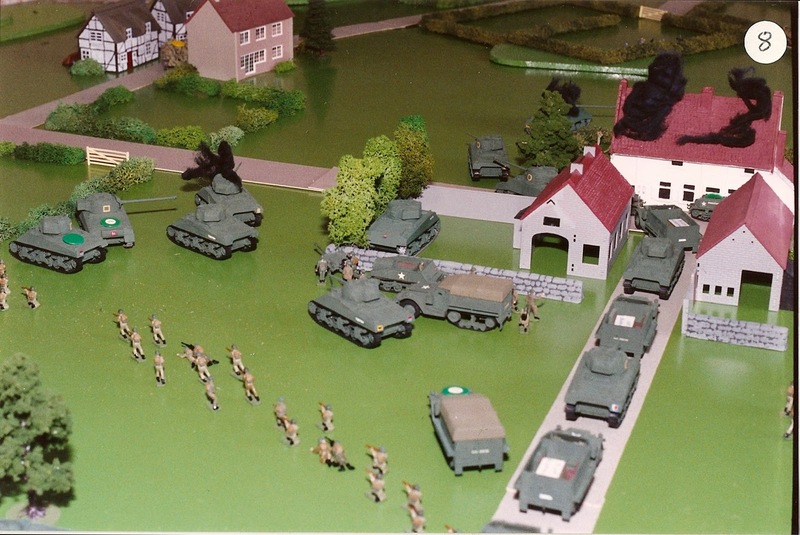 And a pretty basic job on those Shermans and half tracks as well. Fast forward a year or so (around 1990) and the figures are on multiple bases. Nevertheless, you'll see that most of the German figures are still the WW2 German Infantry designed in the 1960s (and purchased by me in the 60s and 70s) The odd resin building is creeping in, but the ceiling-tile hill contours continue to give sterling service. Below again: new house, new kit. For a brief few years I actually had a good size loft to game in. TSS tiles were acquired and the old figures were gradually replaced by metal 20mm. Cardboard roads were still quite good enough, however. Still, not a bad looking table I think. 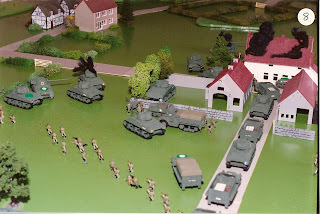 The whole 20mm WW2 collection was sold off in the late 90s to make way for my current collections. The ACW Airfix had gone many years before - probably straight into the bin. 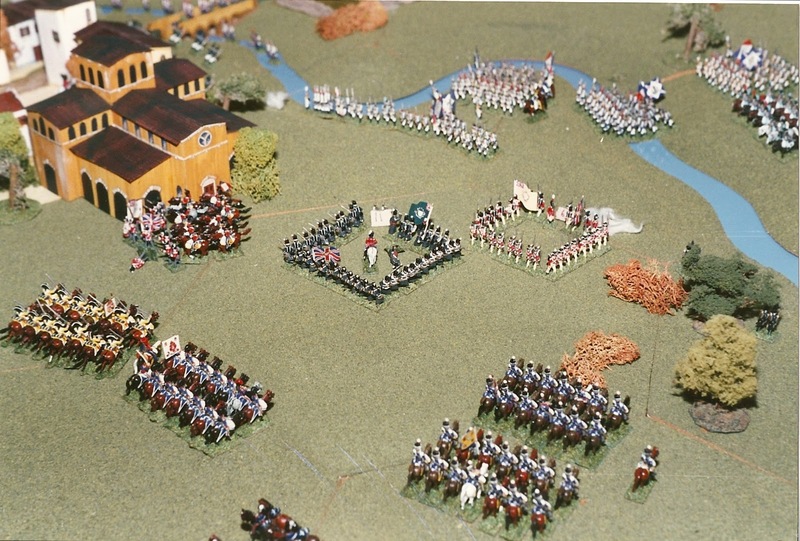 Finally, 2 photos below of a Napoleonic game (from 1989-90 I reckon). A wargames buddy had a much nicer set-up than mine, with a hexagonal tile system and really well painted 15mm Napoleonics from the Peninsular campaign. 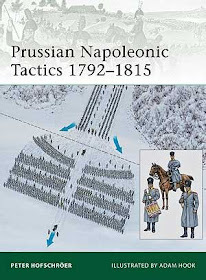 We used WRG 1685-1845 rules. I wouldn't touch those rules with a barge pole these days (though it seems many still use them) but in those days I recall enjoying the games we played, even if they were occasionally rather slow when all the figures were out. And that's about it. How I wish I had taken some photos in the 70s and early 80s. Only some hand written rules and one or two scribbled maps endure from the 70s, and one or two hand written battle reports with maps from the 80s. Hope this has been of some interest. 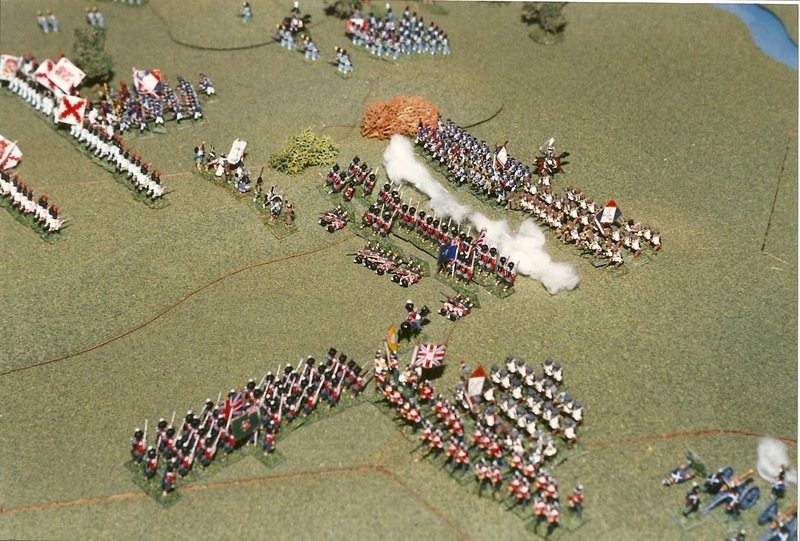 Will get up to date with the next post, with photos of some recently painted SYW Hussars. Byee! Its speed and its capacity to redeploy quickly made it the natural spearhead of the Schutzen Brigade, and it was often used in offensive reconnaissance missions. Hmm.... 'seizing an abandoned bridge'. That sounds fun. Well, the scenario is in preparation for a game next week. Full story and pictures soon after. Meanwhile, enjoy the video.